This year marks the second year that a few colleagues and myself will be hosting a Capture the Flag (CTF) competition at this year's Nashville InfoSec. WHEN: Thursday, September 13, 2012 during InfoSec 2012 conference. You must be registered to attend the conference to participate in Capture the Flag. 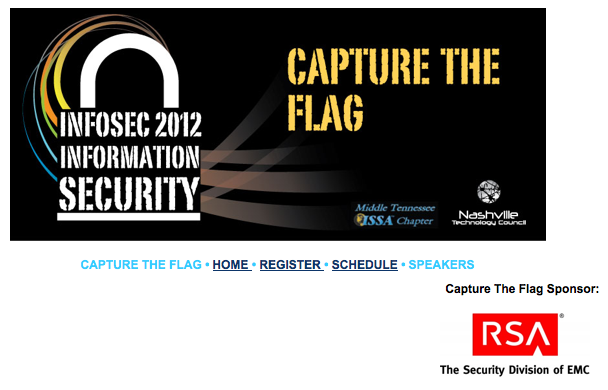 TIME: Capture the Flag will begin after the Morning Keynote Speaker (aprox 10am) and will end at 4pm. You will be able to attend the evening Keynote speaker session. The lunch break will coincide with conference lunch time, however those who wish to keep working may work through lunch. Team members can come and go as they please, but the timer will run continuously. TEAMS: 4 persons per team max. You can register as a team or as an individual who will be assigned to a team. There will be a total of 10 teams max. ABOUT: The Nashville InfoSec Capture The Flag (CTF) competition is a contest designed to test a teams’ knowledge and skill in a variety of areas related to information security, including areas of web application security, cryptography, system exploitation, reverse engineering andnetwork analysis and forensics. Throughout the game, ten teams of up to four members will probe, attack and solve offensive security challenges using skill, cunning and widely-available free tools. Points are awarded to teams based upon the difficulty of the challenge that was needed to capture that particular flag. The winning team will be the one having the most points at the end of the competition. Teams will be scored based upon a weighted point system. Points are awarded based upon the level of difficulty that was needed to capturing that particular flag. PRIZES: First Place Trophy and prizes will be awarded during the reception/ prize drawing at the end of the conference. Email chris.centore@tn.gov, steve.swann@tn.gov or george.romano@tn.gov with any questions concerning the event.